Homer Samuel Henshaw1,2 [Sam Henshaw1,3,4]. Homer Samuel (Sam) Henshaw, 56, died June 9 at his home in Ft. Worth from an apparent heart attack. Funeral services were held June 10 at Baumgardner Chapel with Rev. Donald Johnson officiating. Internment was in Greenwood Memorial Park directed by Baumgardner Funeral Home. Mr. Henshaw was born Dec. 13, 1919 in Haskell County. He was the son of the late Mr. and Mrs. J.W. Henshaw, one of thirteen sons. He served overseas with the Paratroopers during World War II. He was an outstanding athlete in Haskell High School and Decatur Jr. College. He married the former Johnnie Yarbrough of Rule. May 19, 1951. Survivors include his widow, six brothers, Otis and Bill of Seymour, R.C. of Tulsa, Wallace and Archie of Ft. Worth, and Jack Speer of Haskell, along with several nieces and nephews. obituary of Homer Samuel Henshaw, 1976. Ancestry Family Tree data posted by Bobbi Lynn Hall-Rodgers ("juviemom") . 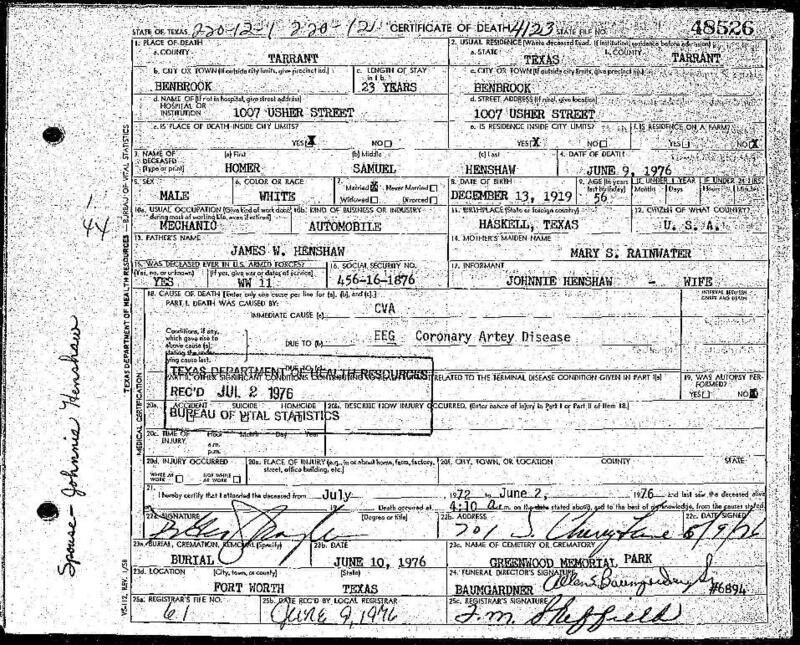 Rootsweb Texas Death Records 1964-1998: http://vitals.rootsweb.com/tx/death/search.cgi.